[Updated] A police officer was injured this afternoon [Apr 29] following a motorcycle collision in the East Broadway area at around 2.20pm. Police Media Manager Dwayne Caines said, “At 2.20pm, police responded to a report of a single road traffic collision that took place in the area of Berry Hill Road and East Broadway. 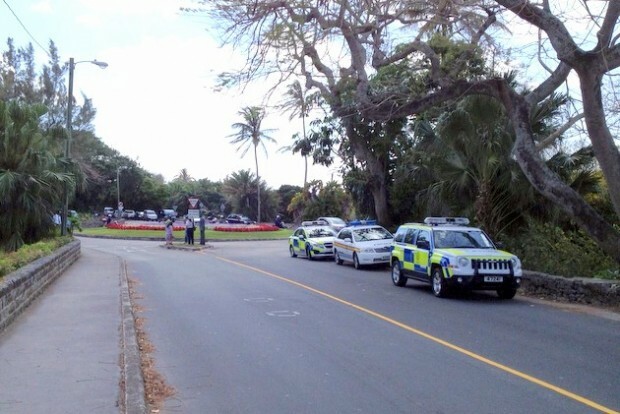 “It appears that an armed response police officer on a motorcycle was traveling in a westerly direction in that area when he lost control of his cycle and hit the onside curb. Mr. Caines added, “This resulted in the officer being taken to KEMH with what we’re classifying as non-life threatening injuries. Update 4.07pm: The Bermuda Police Service has issued an official statement on the accident. A police spokesperson said, “Around 2:20pm on Tuesday, April 29, first responders attended a reported collision at the junction of Crow Lane and Berry Hill Road in Paget. 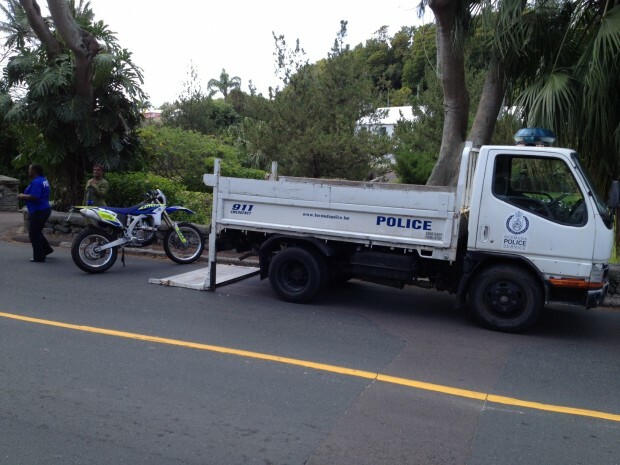 “An armed response officer riding a police motorcycle was responding to a priority call for service when he collided with a curb near the north round-a-bout. “Members of the public traveling through the area stopped to assist the injured officer until EMTs arrived. He was then transported to King Edward VII Memorial Hospital via ambulance for treatment of apparently non-life threatening injuries. “Traffic was diverted away from the area while collision investigators examined the scene. Traffic flow in the area has since returned to normal. wow lots of backed up traffic for a single bike accident all roads out of town are backed up so bad..
happy to hear the Policeman injured is not life threatening and hope he has a speedy recovery. How the hell can police respond to a single road traffic accident when the police were already there. Showing off the new bikes and cars. shame shame shame. He was chasing a suspect! Sheesh bie! Bat yah nawa fal horf yah byke wiff a loadad wapon………………..
3 police cars, 1 truck, 6 cops at the round-a-bout plus the cop was “ARMED”. Hopefully not with a gun – cant even ride properly. East Broadway and Berry Hill. lol That is the Best comment on this post !!!! Hope the rider makes a speedy recovery – and his firearm was secured. I hope when he decides to take his time and it’s you being held up in ya house at gun point or some other situation, you don’t start complaining. One minute they are going to fast next it will be to slow. Can’t please Bermudians. if it was an emergency yes but they speed on those bikes all the time. One came speeding up behind me today like I was a target on a James Bond movie. So please don’t be silly. That Police bike was W-A-N-G-I-N-G!! Get you facts right before you shoot your mouths off. Ask the person who cut him off and drove away like if nothing happened. Ask them to come forward and say something. You should praise the skill of this officer…if could have been a whole lot worse. Always 2 sides to a story. The police bikers are very skilled. I also say as many gave before get rid of that side walk on that corner, or move it further into the property. Stop bashing the police. He was doing his job, more than likely protecting you and I.
all those traffic hold ups & diversions for one bike!! Im not surprised because everytime I see those idiots riding those bikes they are speeding. Its as if they think that they are immune from any danger because they have that uniform on. Well I have news for ya the road doesn’t give a Damn who you are. You must respect the road and its users like you tell everyone else. You are not invincible. The section of tarmac at that point of the roundabout where this happened is a mess. Time to resurface the neglected roads and the BELCO / Watlington scars………..
TO HERE WE GO AGAIN: U SEEM TO KNW IT ALL…. Was he actually going to an emergency call (major incident) with his lights on or did they just say that to cover up that he was just speeding like we all do? It is good that he wasn’t badly hurt. Another accident by a reckless police driver! Lol. One thing is for sure. It is very entertaining to read the comments on here this morning. Some slamming the police others defending them but very few said they actually are happy he wasn’t seriously injured. Who knows what happened, but who cares?!? Nobody died in that accident yesterday. That’s what matters. I personally think he shoulda just cut str8 cross the round about on that type of bike but that’s just me lol… But then ppl woulda been complaint about that. They were going to an emergency. You people are so quick to judge until you need them. Stop making cruel comments about situations you don’t know about… Blasted Bermudians can’t be pleased at all. They are human and have families too. POLICE the only job were they are damned if they do and damned if they don’t…. GEESH. Ergonomicly speaking…it turns at the end…buss lay by was always too close to the round about creating a hazard….de dukes of hazard must have designed dat one!….you don’t see the turn till you get to the corner so your thinking straight untill you have to turn…if your not from here you slow abruptly in front of traffic behind….creating another hazard….then….then you have pretty women in short skirts smiling at you sittin on the bench right at the bus stop….creating another hazard….then if it’s raining and windy….you might as well jump off the bike and call it a day….get it over with….it’s gonnah hap’n anyway..
.s’like a politician and a check book….what did you expect????! Only job where you’re damned if you do or don’t. Interesting perspective. I just wish they hadn’t blocked both side of the road. There was a lot of man power used to redirect traffic, but they may have been looking for this car that “cut him off” like someone said. Not buying it either. Glad he’s ok but there were lots of police still at the hospital come evening time. Seems like a biased priority to me.